There are few events in life that match the impact of a breast cancer diagnosis on a woman’s life. It’s seldom a cancer women can weather privately, as it attacks in intimate, yet obvious ways. 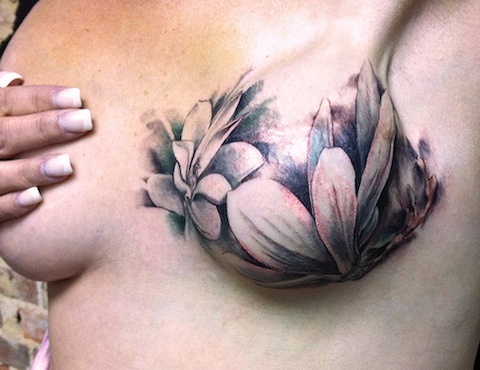 Now, many breast cancer survivors are reclaiming their bodies with beauty and strength with tattoos. 1. 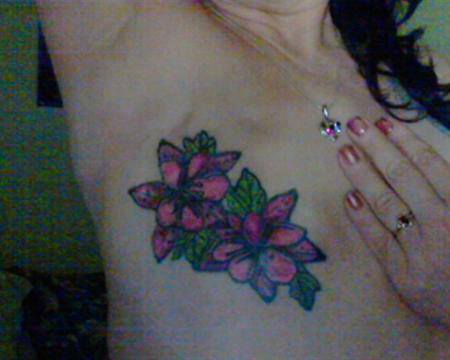 Two-time breast cancer survivor Cari-Anne Higgins opted for a tattoo because she’d had enough of surgery. Artist Autumn Tierney helped her come up with this design to help her “celebrate survival and living her life to the fullest”. 3. Patty Carr had a prophylactic double mastectomy and had to undergo several surgeries afterward when her implants got infected. She went to see Shane Wallin at Garnet Tattoo, who brought her ideas to life in ink. 4. 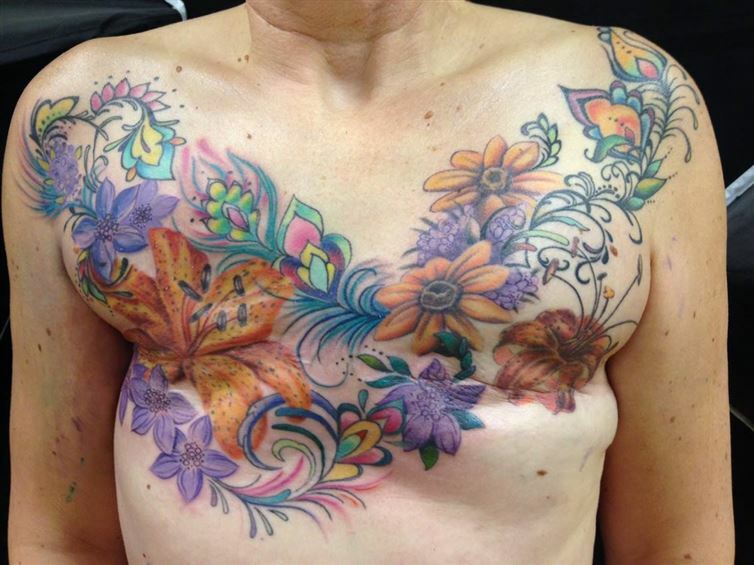 Years after her mastectomy, Barbara brought her design to Darlene DiBona at Sacred Rose Tattoo. 5. 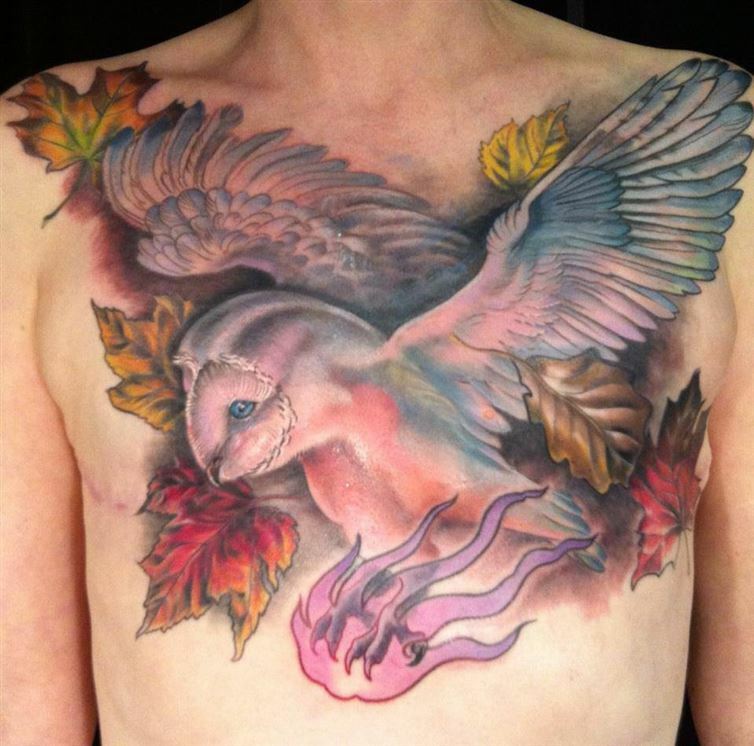 Roberta waited five years after losing one breast to a mastectomy before seeing artist DJ Harley Devries for her tattoo. “It made me feel whole again,” she says. 6. Breast cancer “comes in like a devil when we are not looking and rips into our femininity like a thief,” says survivor Ann Marie Giannino-Otis. She wanted “something to remind her of beauty and growth,” and artist DJ Rose at Halo Tattoo delivered. 8. Adriana had a mastectomy after being diagnosed with Stage 3 breast cancer at age 31. 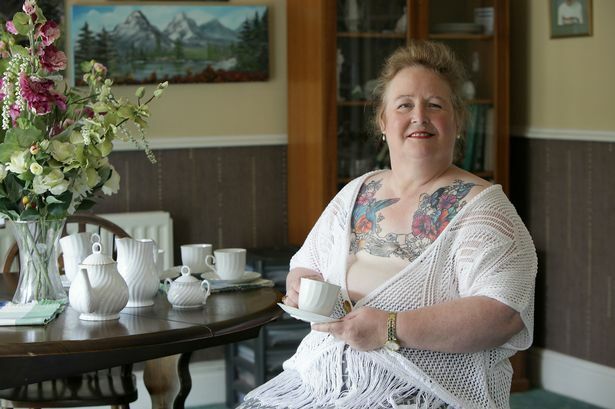 The radiation and chemo treatments ruined her skin, and 11 years later, she went to artist David Allen for a tattoo. The result overwhelmed her. “I feel repaired and whole for the first time in ten years,” she says. 9. 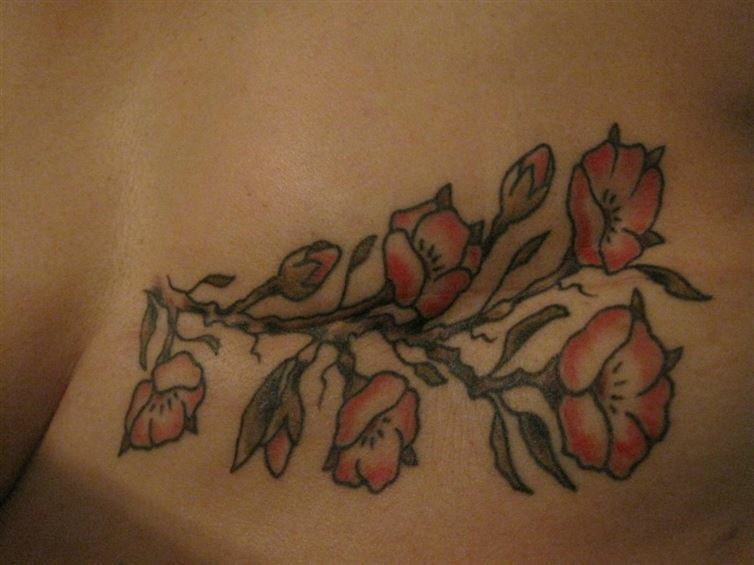 Catherine was diagnosed in cherry-blossom season, so she chose a cherry branch by Gen Gordon of Guts ‘n Glory Ink for her tattoo after her mastectomy. Two years after her diagnosis, her cherry branch symbolized her re-birth. “It gave me strength. It gave me ownership. It gave me hope,” she says. 10. 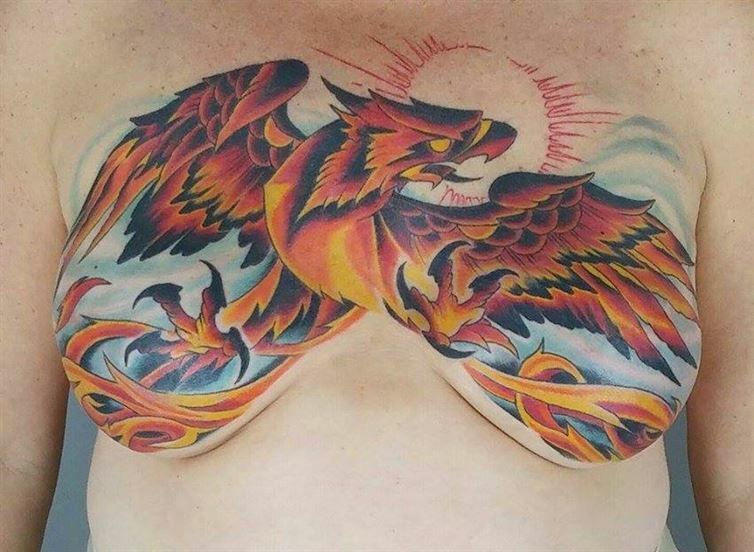 Artist Joseph Andrew of Evolution Tattoo created this stunning phoenix for a cancer survivor at Minneapolis P.Ink Day 2014. 11. 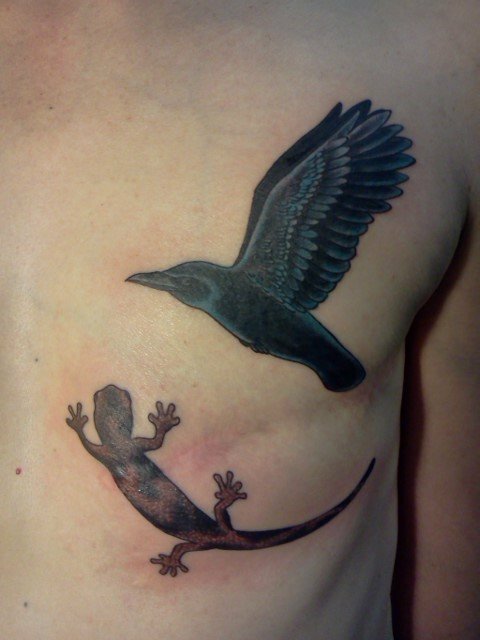 At P.ink Day in Milwaukee, artist Rachelle Krischan brought her survivor to tears with her design. 12. 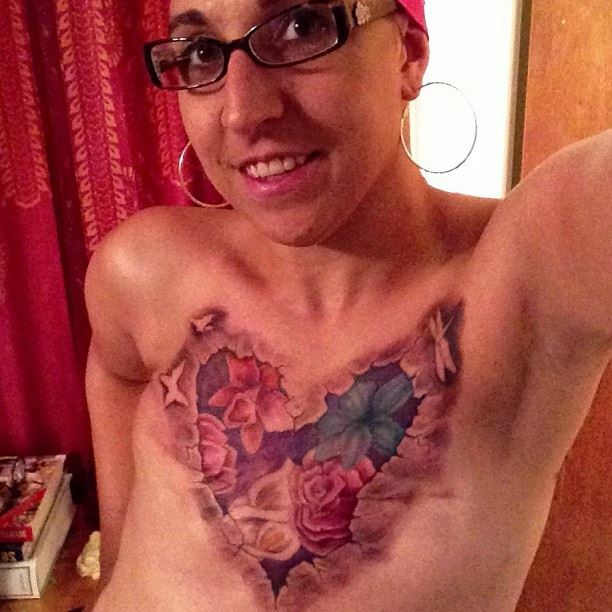 Survivor Melissa Shelley got this lace bra tattoo from artist Rebellious Tony after her mastectomy. 13. Artist Roxx created this tribal design for a cancer survivor. 14. Artist Joy Rumore created this piece for Megan Hartman at P.Ink Day 2013 in New York.